Kimberly-Clark de Mexico SAB de CV is a Mexico based company engaged in the manufacture and distri-bution of the daily use paperbased products. They include disposable diapers, sanitary towels, bathroom and facial tissues, napkins, kitchen towels, hand towels and feminine-care pads, among others. The Ecatepec plant is one of their main production units with four tis-sue machines. The challenge was straight forward : to save as much steam as possible. PES were involved in a process to look at all possible energy saving solutions. Part of the steam generated in the boiler house was used in the de-aerator to heat the softened water. PES we able to offer the Condex Condensing Heat Recovery Unit (www.combustionandenergy.com) which is an indirect condensing heat exchanger. The general rule is that boiler flue gases are not to go below 110°C but this still leaves a significant amount of energy being lost to the atmosphere. The Condex unit breaks with this rule because it is designed to handle the flue gases through the condensing phase and so can recover large amounts of sensible and latent heat. Typical stack temperatures can be less than 50°C and can result in boiler efficien-cies of 95%. PES worked with both Condex and KCM to pro-vide a solution that would give the required benefits but still meet with the usual capital budget constraints. PES provided an energy balance for the existing system and the system with the Condex unit to show the expected savings. PES were responsible for the supply of the Condex equipment including all issues related to importing the unit from Canada. KCM were responsible for the installation of the unit and PES coordinated between KCM and Condex to en-sure that all design issuesvwere covered. 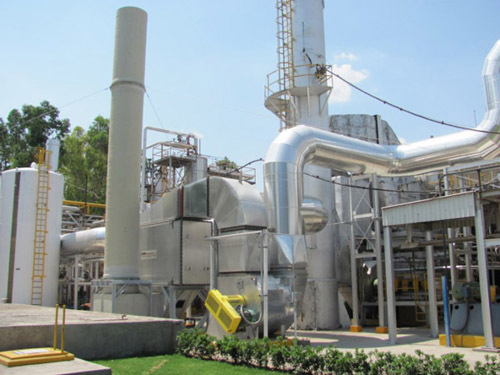 PES were involved in several other projects at the Ecatepec plant and are the distributors for Condex in Mexico. The Condex unit started up without problems and produced the expected savings. The steam used by the de-aerator re-duced from around 3 t/hr to around 0.7 t/hr. The overall payback was around 2 years.